The international registy fee was fifteen cents from December 1, 1925 to February 1, 1945, and the international return receipt charge was five cents from April 1, 1879 until November 1, 1953. A registered airmail letter, return receipt requested, sent to any country with a thirty-cent airmal rate would have cost fifty cents from the beginning of the Prexie period until February 1, 1945. 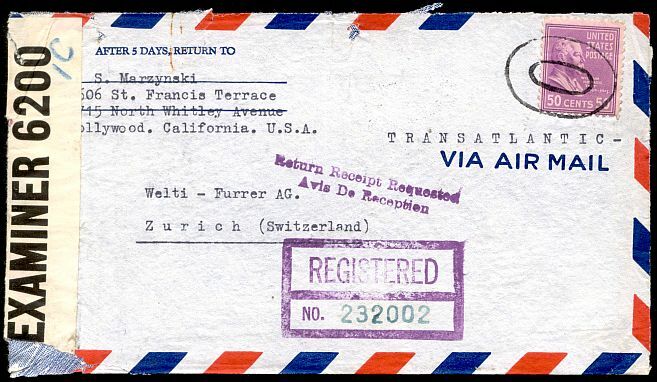 A cover sent airmail, registered, return receipt requested from Hollywood to Zurich, Switzerland in May of 1942. The international registry fee went to twenty cents on February 1, 1945 and remained so until January 1, 1949. The return receipt charge remained five cents during this period. Between these dates any airmail letter to a country where the postage was twenty-five cents would end up costing fifty cents including those fees.